← The first man I loved. I made coconut cream pie for Father’s Day. It is my dad’s favorite and one of my favorites too. I think I have made one or two in the past but I never realized the labor of love in making one from scratch. But after 4 stages of creation, I think it turned out pretty good. On Friday night, I made the dough for the shell. On Saturday morning I rolled the dough and baked it. I made the custard and toasted the coconut for the top on Saturday night. And on Sunday afternoon I whipped the cream and put the whole thing together. None of the stages took very long. And I think it was totally worth it. I used Emeril’s recipe, which can be found here. By the way, I do not recommend attempting your own pie shell if you are a perfectionist. It hardly stayed together and required me to do some patchwork once in the pie pan. No biggie, but slightly frustrating. It might be too much for someone who requires it to look perfect. Mine certainly does not! Another tip? I used uncooked beans in the bottom of the shell to keep it from bubbling up while it baked. Turns out, the beans sort of settle into the shell. I spent the better part of the movie Catch Me If You Can picking beans out of the bottom of the shell. Lesson learned? Line the bottom with foil prior to putting beans or anything else in the bottom. AND perhaps a purchase of some weights are in order. Looks delish! I think it’s time for my afternoon cookie break. LOL about the beans, totally something I would have done. I was once told to use pennies–on a foil lining, obviously, because they conduct heat at actually help cook the crust. I too am unable to make a perfect looking crust, even though my mother has the perfect pie crust gene. I think it just makes it look authentically homemade. 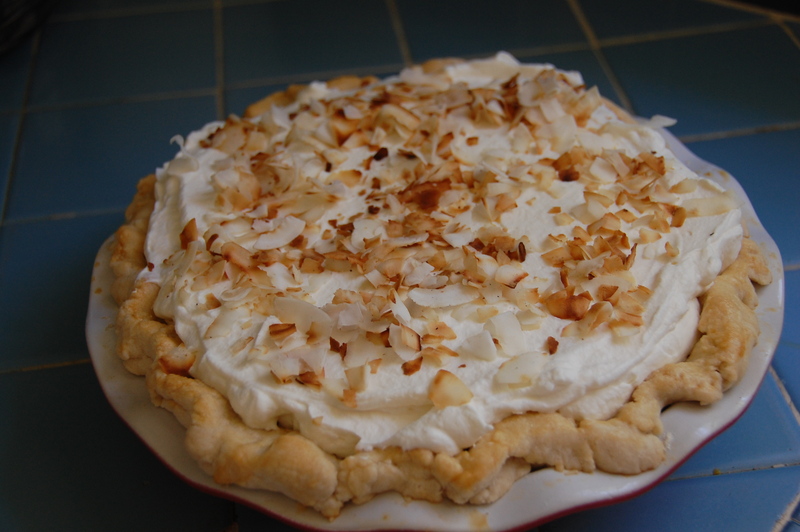 My husband loves coconut cream pie, so maybe I’ll make him one someday (I, unfortunately, am a life-long coconut hater. As in I loathe it, unless fresh from a coconut). Thanks for sharing–I always enjoy reading your posts. keep em coming!